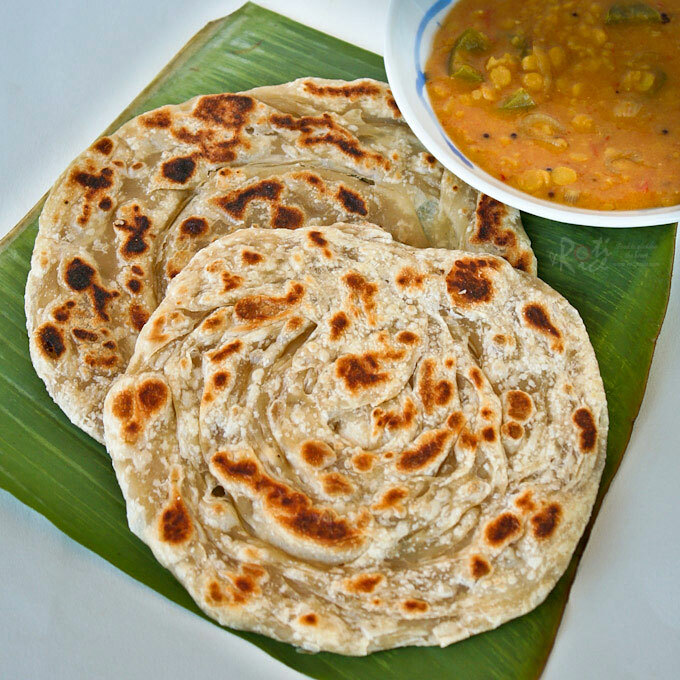 Roti Canai (pronounced as “chanai”), also known as roti paratha, is a type of flatbread found in Malaysia. It was introduced into the country by Indian immigrants and over time became a national dish. People of all races there enjoy Roti Canai and it is very, very popular, eaten throughout the day. When Rachael of Lee & Low Books, a children’s book publisher, invited me to do a roti recipe and book feature on “Hot, Hot Roti for Dada-ji”, it put a BIG smile on my face. The title of the book resonated well with the name of my blog. Roti n Rice coupled with Hot, Hot Roti, how exciting! 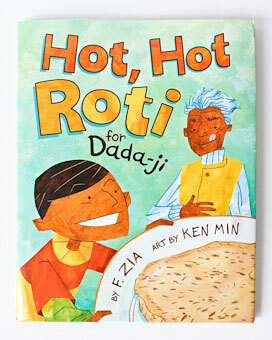 Hot, Hot Roti for Dada-ji is written by F. Zia, a writer and elementary school teacher who grew up in Hyderabad, India. This is her first picture book, written as a gift to her grandchildren. What a wonderful way to share a culture and a little bit of her past with the future generations! She did a wonderful job of weaving a fable from a faraway land with contemporary suburban Western life as evident in the final part of the story. This book is fully illustrated by Ken Min, an animation storyboard artist. The drawings are vivid and imaginative, conveying the text beautifully. They make the story come alive and keep you turning the pages for more. The good people at Lee & Low Books have generously offered a copy of this book as a giveaway to one of my US readers. This book will only hit the bookshelves in May 2011. To win an early copy, please leave a comment on this post telling me your favorite childhood food. For those of you who are new here, you would make my day if you can follow me via Google Connect on my sidebar, Twitter, “like” me on Facebook, or subscribe to my RSS Feed. Thank you so much for visiting and following. This giveaway will be opened until 9:00pm central time on Thursday, April 7th, 2011. I will randomly pick a winner and the book will be sent directly to you from the publisher. Time to bring out the tavva (Indian flat griddle)! I made my own ghee (clarified butter) for this roti as it does make a whole lot of difference to the taste, aroma, and flakiness of the bread. Ghee can also be purchased at the Indian grocery stores. You can certainly use vegetable oil if you prefer. Combine flour, salt, and sugar in a large bowl. Make a well in the center of flour and pour in ghee. Mix with a spatula adding water a little at a time until a soft sticky dough forms. Turn onto a lightly oiled surface and knead with oiled hands until a smooth and soft dough forms, about 5 to 7 minutes. Divide dough into 6 equal portions. With oiled hands shaped into balls. Wrap dough loosely with cling wrap and allow it to rest for 4 to 5 hours. This method is known as <strong>menyebar</strong> which means spreading. It takes a lot of practise but it is also quite fun. I ruined my first one and had to use the rolling pin method to salvage it. Lightly oil working surface and hands with ghee. Flatten a ball of dough with your palm. Lift dough facing you with the right hand on the top and left hand on the bottom of dough. Fling dough to the left to spread it out. Do this several times until dough is very thin. Fold dough into thirds and then half lengthwise, into a rope, trapping some air if possible. Holding down one end, create a spiral with the dough, tucking the other end into the center. Repeat with the remaining dough. This method is definitely easier but the dough will not be as thin as the flinging method. Still it was pretty good. Lightly oil working surface and hands with ghee. Flatten a ball of dough with rolling pin and continue to roll until dough is very thin. Fold dough into thirds and then half lengthwise, into a rope, trapping some air if possible. Holding down one end, create a spiral with the dough, tucking the other end into the center**. Repeat with the remaining dough. Heat a tavva fry pan with some ghee. Stretch out prepared dough by pressing with the tips of your fingers on work surface into 7-inch rounds. Place on hot tavva or pan and fry till golden brown on both sides. It takes about 3 minutes for each side. Fluff up fried roti by whacking it with both hands coming together on a flat surface. Serve immediately with some Dhal Curry and/or Chicken Curry. **Most people just fold the spread out dough into a square and place it immediately on a hot fry pan or griddle. I like the spiral method better as it creates beautiful layers in the roti. Disclaimer: Although a copy of this book was sent to me for free, I did not receive any monetary compensation for this write up. What was written are my personal thoughts and view. For full disclaimer, please click here. So super awesome!!! And this recipe is a keeper for sure. I could just eat and eat and eat this. Biren, you made your own prata. That is awesome, looks exactly like the frozen prata I bought at the supermarket. I’ve never thought of using the rolling pin to make prata before. Thumbs Up!! Ann, this was so much fun. Flinging the dough was very challenging but it became better once I got the hang of it. Will have to continue to practise so that I can get it even larger and thinner. Great looking roti canai. Thumbs up! I love this with fish or chicken curry! Yummmy! My favorite is with tangy fish curry but I made dhal and chicken curry this time. How exciting! Beautiful book and and loved the drawing on it. Loved your step by step on the paratha.. Thank you! Yes, most definitely! Their contribution to the cuisine in that part of the world has made it so much more spicy, fiery, and interesting. How amazing, who better suited suited to review this new book then Roti and Rice..I love when authors work to perserve their culture, to pass wonderful traditions to the next generations..great post and the roti look amazing!! ps, thanks for stopping by new latina, it really meant alot! Thanks Bonnie! You are sweet! Love your ice cream and pepita brittle. Please count me out of this giveaway as I’m Canadian and not qualified. How sweet of you to share your roti canai recipe with us to help promote this book. I never knew these were made in spirals as you showed in your pictures. Such a wonderful step by step tutorial, Biren. Your roti canai turned out beautifully. I really must stop reading your blog early in the morning. It makes me think of mouth water foods all day. Have a lovely weekend. Best of luck to all your US participants. Sorry about that LeQuan. I’ll have future giveaways open to everyone. These rotis were fun to make not to mention that the ghee kept my hands nice and soft for the rest of the day. Great moisturizer! awesome!!! love ur..step by step presentation..have a great weekend..
Oh my! 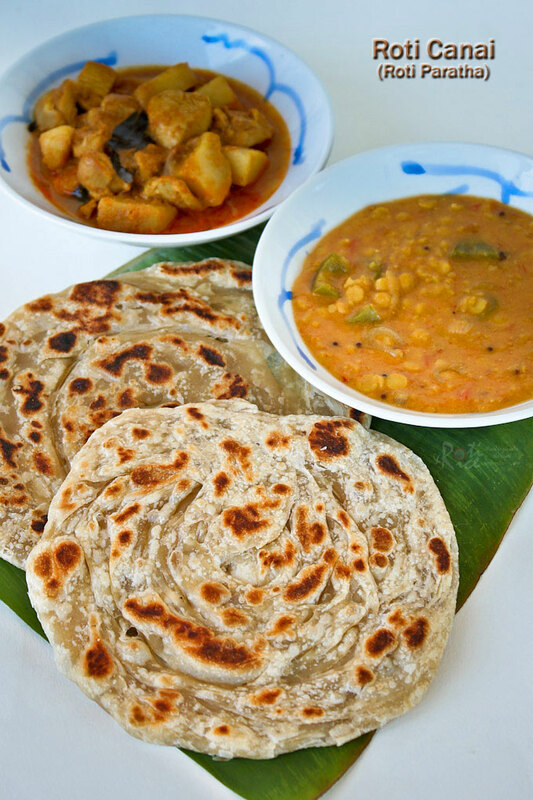 I LOVE roti… I think homemade roti must be SO GOOD! I wish I have that right now to snack on. What is ghee (clarified butter) and where can I buy it? Ghee is made by simmering butter until all the water (moisture) in the butter has been boiled off. The milk solids will sink while the scum will float to the top. Whatever remains after straining is fat or oil. Ghee is widely used in Indian cuisine. You can buy bottled ghee at the Indian grocery stores. Thanks for answering Biren! The store is 10 minutes away. All I need a teacher who will do it with me. 😉 But seriously I will try this one day. I have to! Some of the Malaysian Indian community did originate from Malabar bringing their wonderful curries and roti with them. Over time, this cuisine has spread to the other races in Malaysia. This roti canai looks incredible! Thank you so much for the step by step instructions and photos on the rolling, I would definitely love to try to make this for 5 Star Foodie Jr.! 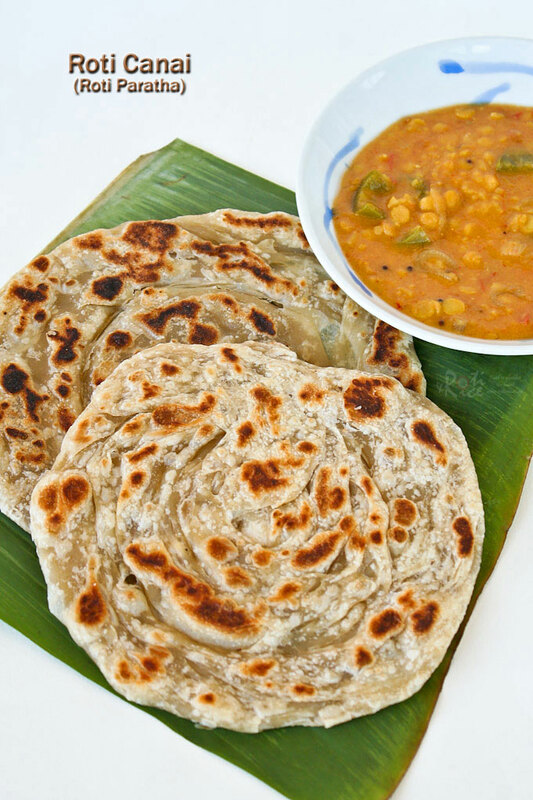 I love roti canai – yours look great, and easy to make! I am saving this recipe to my favorites to try sometime soon. Thanks for sharing! I know this roti must be delicious because I started drooling immediately upon seeing the picture. Now you’ve got me craving spicy indian food at 8 AM! Those roti look so good! I love the pan you used too. Kinda cute. Thanks for letting me know. It’s good to be able to make the connection. 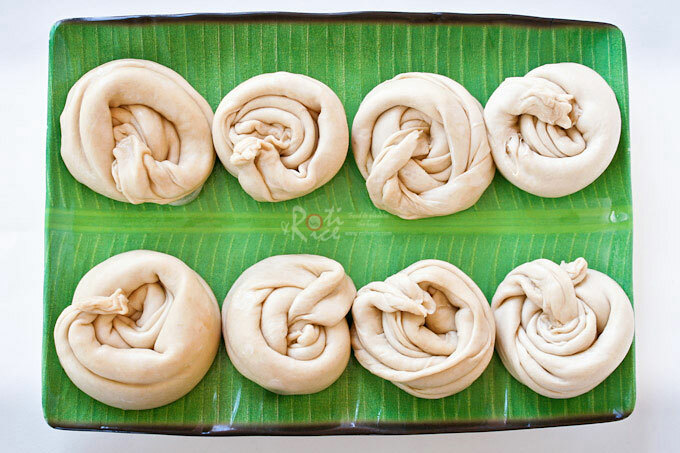 The Roti Canais look simply beautiful and delicious…!!! Love your roti canai… Its been a long time since we have our roti fix. ..many times try to tebar the roti but failed miserably..
looks yummy! gonna try it for dinner definitely! That’s so nice of you. Thanks for visiting. I’ve been experimenting with Indian flatbreads lately – I just picked up a big bag of atta flour. I’ll definitely use the tips here to put the atta to use! Wonderful! I’ll have to get some of that atta flour too. My favorite childhood food was roti canai. When I was young, my mom, sister and I would ride our bicycles out in the morning to get fresh produce from the market and stop by the nearest roti canai shop to “tapau” roti canai and dhal curry home for breakfast. I’d love to win this book now that I’m in the US and can’t get my 60sen fix of roti canai anywhere. I can just picture the scene. Never needed to make our own as it was so easily available and inexpensive yet so delicious! I sometimes order roti from one of Asian restaurants that does home delivery but yours look so much better, Biren, thanks for the step by step photos, can’t wait to give them a try. Great demonstration on making that bread. Looks yummy. i grew up eating these as my midnight snack! they’re super delicious! I also love eating roti planta(margarine), they made me gain a lot of KGs !! Wow you have a tavva! That’d be my point of envy 😉 And super wonderful that you’ve just homemade my favourite Malaysian breakfast! Ok I’ve so much to say that this is going to be a long comment 😛 My favourite childhood (till now) food is nasi lemak, the good ‘ol $1 (or was is 50 cents back then?) pack, nothing fancy, just the essentials 🙂 And it’s such a great collaboration that I’m looking forward to the book! Mmm… reminds me of one of my favorite childhood treats in Taiwan. Flat bread stuffed with scallions and sometimes shredded turnip. Soooo good! My favorite childhood memory was of pancakes but not the big, fluffy kind. Our pancakes were made on the order of crepes. My father always made them and I floated lots of butter on them, rolled them up, and covered them in powdered sugar. Sweet, wonderful memories. My niece married a wonderful young man from Sri Lanka and they now have a beautiful 2 year old daughter. They are coming to visit us in June, along with his mother and father from Sri Lanka. I would love to have a copy of the book to present to them so that her grandfather could read it to her. Sad to say, my favorite childhood food was nothing healthy. Snacks from the mama-shop – KAKA, Twisties, Chickadee…. Great job, Biren! Good luck to all contestants! I need to make my own roti too! Good luck to the winner. As a child, one of my favorite things was cream of mushroom soup over rice. I have had this at a Malaysian restaurant in Seattle and we call this Paratha in India where lot of oil is used instead of the butter. Looks delicious with the stepwise instructions. Biren, your roti canai looks so professionally-made! I live for the step-by-step, what a great job! Origins of roti can be found here http://en.wikipedia.org/wiki/Roti_canai. It is usually eaten with dhal curry or Indian style meat curries. My post for the dhal curry is here https://www.rotinrice.com/2010/09/dhal-curry/. If you would like to check out a Nyonya style curry, please click on this link https://www.rotinrice.com/2010/02/chicken-curry-with-kaffir-lime-leaves/. Wow, I am CRAZY about roti canai! I tried several recipes and failed miserably. Now maybe your recipe with the step-by-step instructions will be my lucky break! I am pinning this to try when I get a little more time :-). Hi Biren, yesterday i made it, ok i used the pin roll methode but it was very nice. The only thing what makes me wondering, i only need 210ml water, not 360ml. For all the other ingriedients , i sticked exactly to the recipe. I am not surprised at all that you needed less water. I think it really depends on your flour and I have mentioned this before. I noticed that my flour gets really light and dry in the winter, hence more water is needed. I tend to use a little less water during the humid months of summer.